st ives | Matilde learns beauty. I’ve done it! I have mastered the bath. With almost 3 years of only having showers, our new house has given me the possibility to bathe in a bath of luxury. It has been a bit of trial and error and I have now discovered, and mastered, my perfect bath. – Face Mask. My weapon of choice is Lush’s Cupcake. Yummy! – Bath Melt or Bomb. I prefer the melt – it leaves me all smooth and luscious and oily in a good way. – Lip scrub. I either use my Mecca scrub or my Lush popcorn scrub. The second option is tasty. – Face Wash. Currently I am using St. Ives Blemish Control Green Tea Scrub. Loving this! – Candles. Many many candles. – A good relaxing playlist. My choice at the moment is the Parenthood Season 2 soundtrack. 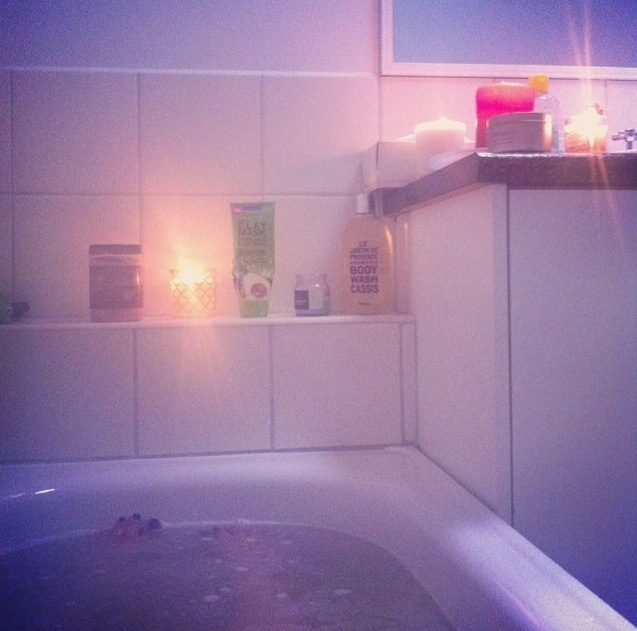 Light your candles – I like to turn the bathroom lights out and sit in the ambience of the flame. I also like to have everything in its place. Once I am in the bath, there should be no reason for me to bend, move or lift myself out of the water. My tipto having a damn comfortable bath is investing in a bath pillow. Not one of those blow up ones, a squishy one. I picked mine up from Spotlight for $9. Turn on taps. Let that baby fill! If you have just washed your hair I suggest putting it up and pinning it so your hair is not on your face. Apply liberally and let your face tighten, cleanse, relax. Step 3. Melt the bath melt, melt yourself. It is time to indulge my friends. Put your bath melt in and sit. This is the best part – really let yourself relax. Once you have woken from your bathy slumber, it is time to wash off your face mask. Use a flannel, use your hands, just wash it off however feels best for you. Follow up with your normal cleanser and wash. The reason I decide to do my lip scrub after the bath is because once you have put your lip balm on, you do not want to put your face under hot soapy water. Trust me. From experience, it is not good. Moisturise your face, your body, your whatever you wants. Make sure you moisturise your face, neck AND shoulders. We want to keep our skin looking and feeling young! That is it. It shouldn’t be much work, it should be simple and relaxing. Once you are out, you should feel like sleeping. As I do now. I have had my masterful bath and I’m ready for a good nights sleep. I just have to get James off of the computer.